4th year Pic 212 - Aug - 30 2012. Lined up - Coonoor To beat the heat people have soda with fresh lime (lemon) and I noticed this line up at a stall on way to Coonoor. Critiques welcome! Last shot This is going to be my last shot for sometime as we are leaving for Turkey tonight and will return after 12th Sept. Please excuse my lack of comments as have still got to pack and do last minute errands! Have fun, will catch up on return. Fantastic - beautifully seen and shot - love the dof! Neat shot and interesting commentary! Outstanding; one of my favorite kinds of shots! Have a great time on your trip! Great line-up! Have a great trip! What an interesting catch -- love the repeating shapes! Have a wonderful -- and safe -- journey! I like the repetition Harsh. 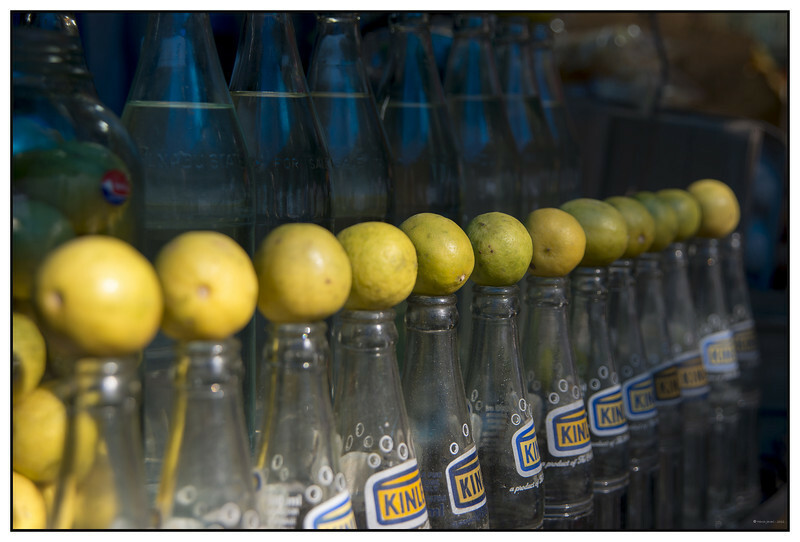 I might have featured the labels more, moving the limes closer to the top of the frame as there is not much interest in the bottles behind the limes. Excellent! Have a great trip!